Is moss on the roof an urgent problem? Regardless of the type of roof that you have on your home, chances are that at some point you will notice a build up of moss. An older roof is obviously more likeley to suffer from moss than a newer roof. So what do you do about it? Does it need to be removed and is it doing any harm? The fact is, moss can cause problems, but usually only when there is a lot of build up on the roof and when it has been there for some time. 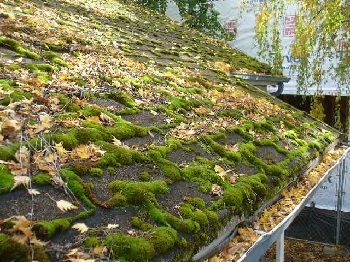 Older roofs will have more moss, and it makes sense to inspect it regularly. It can force its way between the roof tiles, opening up a gap from which water can enter the property. A lso moss is like a sponge, and it has the ability to hold a lot of water. Which means that lots of moss is holding lots of water: water that is lying around on your roof. Adding to the weight and stress on the roof. The strength of an old roof may not be as good as a newer one, so removing that accumulated moss makes sense. So the general advice is to leave it alone until it starts to cause you a problem, because it can be a messy and expensive project to remove the accumulated moss. Moss accumulation can cause other problems too, especially in your guttering. Heavy rains can wash any loose moss into the gutters and downpipes, adding to moss that is already growing there, causing the rainwater to overflow and enter the building or damage the wall. It is a good idea to check them on a regular basis and remove any moss if possible. 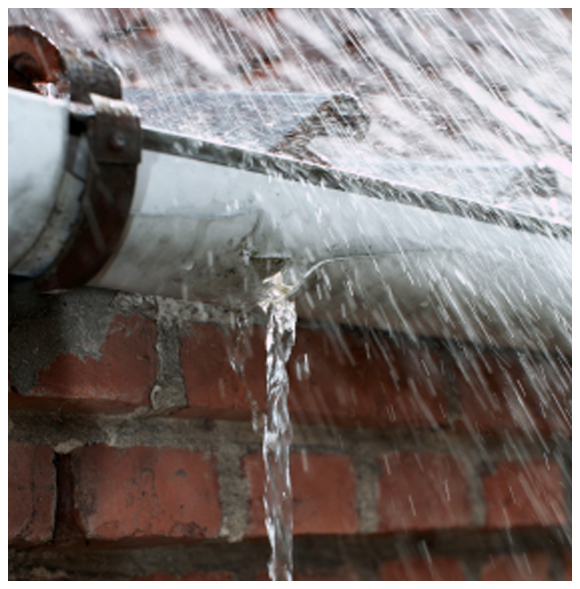 Most homeowner give little consideration to how important your gutters are to the outside of your house. While they are working and in top condition, rainwater is carried away and down the drainpipe, safely away. If they were not there, water would run down the outside brickwork, letting damp into the house and damaging the bricks and mortar. So it is important that you as a home owner keep a careful check on the guttering to watch out for any potential blockages, which are often caused by dirt, moss and leaves building up over time. These blockages can sometimes be washed away and into the drains, where they can also cause problems and blockages, which require jetting to unblock which can be expensive. Most DIY-ers can clean out their guttering regularly with a quick trip up the ladder. An easy job if you are in a single storey house, but in a two storey you would probably be better off hiring a local contractor to do that for you. You should always consider your safety, and it is much better to hire a local company than to risk your own life and well being. If you do want to attempt the job your self, be sure to follow health and safety guidelines, have somebody hold the ladder at the base while you are working, and be sure to secure your ladder at the top to something solid while working at any height. Do not try to attempt something that makes you uncomfortable or if you feel you are working outside of your comfort zone. Remember safety first whenever you are working at home.